Our Florida-based VO2GoGo instructor Karen-Eileen Gordon has been described as psychic, with killer spreadsheets (she’s a Japanese energy healer and life-long meditator…with a numbers-oriented degree from an Ivy-covered hallowed hall and a big crush on entrepreneurship). She happily leads one of the monthly VO2GoGo live Zoom workouts for our VO students around the globe. She is an actor-writer-coach who has logged hundreds of joyful hours on sets and in recording studios all over Los Angeles, Atlanta and Miami. Voiceover was one of Karen-Eileen’s first creative loves: while other kiddies romped in the sunshine, she kidnapped her baby brother and forced him inside to co-create radio dramas (years later, she got to work with BBC Radio Drama in Bristol, England…to create the fancy-pants real stuff!). Before leaping into the creative world full-time, Karen-Eileen worked in corporate America as an award-winning advertising copywriter and a radio producer for the Armed Forces Radio Network. She brings experience recording for lots of national brands (among them Chevy, McDonalds, Marie Callender’s, Pet Supermarket, Atlantis and Sandals Resorts), truck-loads of patience and a fiery desire to help her clients succeed to her coaching experience. And Karen’s not only an instructor, she’s one of VO2GoGo’s Featured Talent. Seen on screens large and small, Karen-Eileen’s television adventures include two seasons on the STARZ Original Drama MAGIC CITY, a recurring guest-star on A & E’s THE GLADES, and a wholly-improvised role on HBO’s CURB YOUR ENTHUSIASM. As a film actress, Karen-Eileen starred in the independent comedy A FREE BIRD, and is attached to her first horror film, scheduled to shoot later this year in Los Angeles. In the theatre world, Karen-Eileen wrote/produced a mini version of the one-woman show LIFECAB! at The Whitefire Theatre in Studio City, and was part of the L.A. Film Festival’s “Page-to-Stage” project, highlighting a play on its journey to becoming a feature film in Zephyr Theatre’s THE POSSESSION OF MRS. JONES. 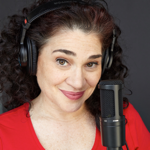 In the VO world, Karen-Eileen has a permanent mad crush on audiobooks, and is always merrily “in production” on ACX. Animation is also beloved; favorite journeys-so-far include bringing a British stingray to life in the DOVE Award-winning children’s animated series THE FISHIES, and creating several awesome improvised Latina women in the Rockstar Games/Take-Two Interactive videogame, GRAND THEFT AUTO V.
Originally a Philly Girl, Karen-Eileen grew up in South Florida (Hollywood!) before literally moving to the “other” Hollywood to dive fully into the creative life. A huge lover of the wellness arts, Karen-Eileen is a certified yoga instructor specializing in Restorative Hatha (RYT200/Yoga Alliance) and long-time Reiki Master. She holds a degree in Economics from Harvard, where her daily changing outgoing voicemail messages got her voted “One of The Ten Funniest” by her ivy-strewn classmates. Karen-Eileen is repped theatrically by Matt Chassin Management and Landrum Arts LA, for voiceover by J. Pervis Talent, for commercials by Talent Direct Agency, for hosting by Brevard Talent Agency, and for print by Boca Talent and Models Agency. She is available for one-on-one coaching via Zoom. You can reach Karen-Eileen via email at Karen@VO2GoGo.com.